ROCKFORD — Eight months ago, Nick Johnson put down the drugs and picked the guitar back up. He went from being homeless — a product of his drug abuse, he said — to moving into Rockford Rescue Mission, a 24/7 recovery and rehab facility located at 715 W. State St. There, he rediscovered his love for making music. “God’s given everyone a skill or a talent, but sometimes it’s buried deep down and you have to act out your creativity to discover it,” said Johnson, 21. Johnson still has some time to go in his treatment at the mission, but now he has a place to hone his God-given musical talent while he’s there. The mission on Friday officially opened the Howard and Lucille D. Dittmar Performing Arts Center. 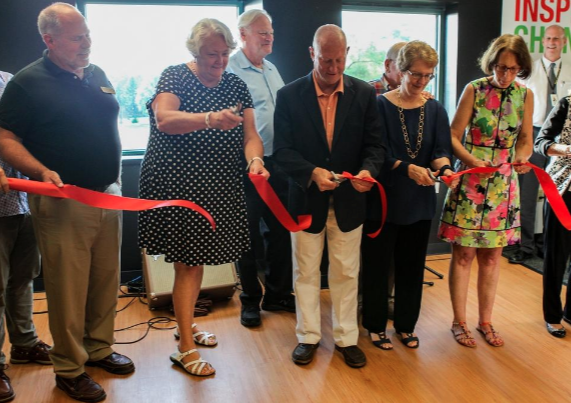 The 1,250-square-foot facility on the second floor of Rockford Rescue Mission provides a colorful work space for residents of its Life Recovery Program to develop their talent in music, theater, dance and other performing arts. The new center has a recording studio, two private practice areas and an area dedicated to dance. Murals and artwork line the multi-colored walls.